The wedding of Prince Harry and Meghan Markle was always going to be the highlight of the royal calendar in 2018, but there's been plenty going on a little further down the royal pecking order since their nuptials in May. The queen's granddaughter Princess Eugenie got married at the same chapel as Harry and former actress Markle, who reportedly stole Eugenie's thunder by telling the senior royals in attendance that she was pregnant. 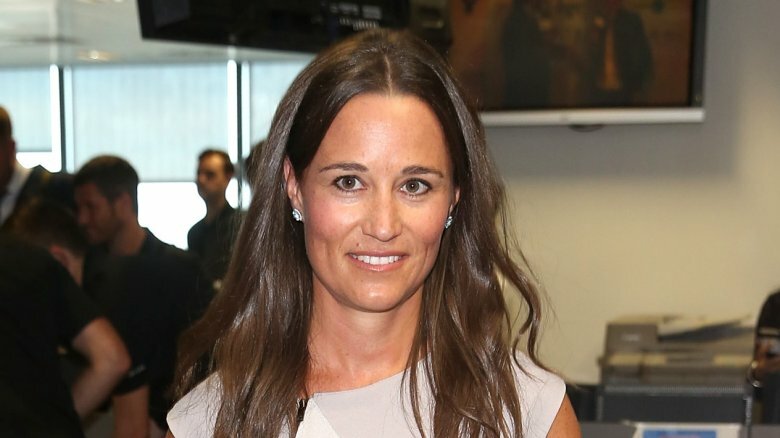 In other baby news, Pippa Middleton recently gave birth for the first time, though her son is set for a very different upbringing to both Markle's unborn child and the children of her sister Kate, the Duchess of Cambridge. Prince William and Kate Middleton's three kids will all grow up in an environment that would be completely alien to the vast majority of kids in the United Kingdom, but as the future king, George in particular is going to have a totally different life to his young cousin, and here's why. One of the first things that people tend to ask about when news of a new royal baby breaks is its future title, though not every child with a connection to the royal family is automatically assigned one. While Prince Harry and Meghan Markle's baby will indeed inherit a royal title similar to that given to Prince George and his siblings (peerage expert William Bortrick is predicting that the queen will dub the child His/Her Royal Highness, Prince/Princess of Sussex), Pippa's son will not be given one at all, because neither she nor her husband have titles to pass down. "Pippa is Mrs. James Matthews, [so] her kids will be Master or Miss 'Christian name' Matthews," royal historian Marlene Koenig told Town and Country. "No titles whatsoever." 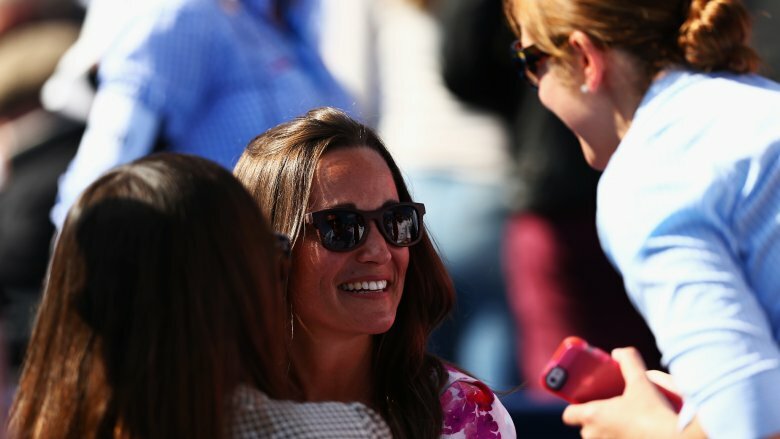 Pippa and her husband have gone by the names Laird and Lady of Glen Affric since Matthews' father purchased the 10,000-acre Glen Affric estate in the picturesque Scottish Highlands back in 2008, though these are more honorary than anything else. "[James'] father bought a feudal barony," Koenig explained to the long-running lifestyle mag. "'Laird' is not a title, but a description applied by those living on and around the estate. Ownership of a souvenir plot of land does not bring with it the right to any description such as 'laird,' 'lord,' or 'lady.'" The way the queen waves looks like it requires minimal effort, but learning this patented greeting requires a certain degree of dedication, as both Kate Middleton and Meghan Markle have found out. "The wave we saw on the Duchess of Sussex's engagement was what we all would do on a day to day basis when waving at someone, however the wave we saw on her wedding day is that more fitting of a royal — it was graceful, dignified, elegant and similar to the wave we would expect of members of the royal family," royal butler Grant Harrold told the Express. "We saw similar changes over the early years with The Duchess of Cambridge." As he isn't destined to be a working member of the royal family, Pippa's son won't have to concern himself with the ins and outs of royal etiquette, unlike his cousin. 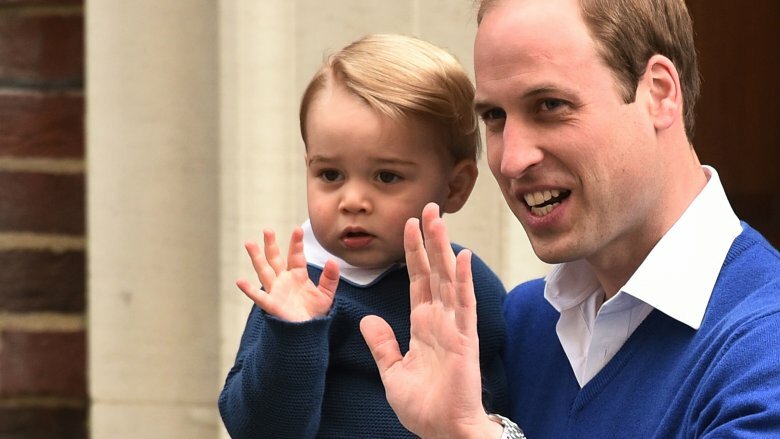 Prince George will be using the trademark Windsor wave a lot throughout his life, which was why he started learning how to do it from a young age. The prince was already waving at photographers like a pro by the day his sister, Princess Charlotte, was born. "From the familiarity of his father's arms, Prince George felt confident enough to grant the crowd a distinctly Windsor wave," the National Post reported from St. Mary's Hospital in west London. 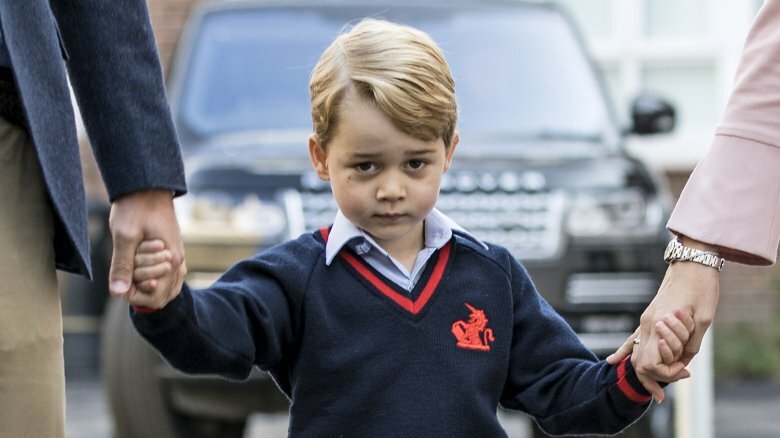 There's a number of bizarre old laws still technically in force throughout Great Britain today (it's illegal to "handle a salmon in suspicious circumstances," for example), and there's one outdated piece of royal protocol that will undoubtedly have an effect on Prince George's life in the coming years. Royal rules dictate that heirs cannot travel on airplanes together, meaning George and his daddy (third and second in line to the throne, respectively) aren't supposed to fly together when the family goes on holiday/tour. Only the queen can make an exception, which she has done by giving William the go ahead to travel with George on a handful of occasions. He went to Australia and New Zealand with his parents in 2014 and has visited Canada, Poland and Germany since. In truth this rule was brought into being when air travel wasn't anywhere near as safe as it is today, but the older George gets the more likely it is he'll be made to travel separately from his father, to protect the line of succession. Pippa's son, on the other hand, will no doubt have countless memorable family holidays as he grows up. She and husband James Matthews spent time traveling the world in 2017, and their son will be free to join them on any and all future flights. According to E! News, he could well be destined for a "more fabulous life" than his more famous cousin. Have you ever wondered why it is that Prince George is always in shorts, no matter the occasion? 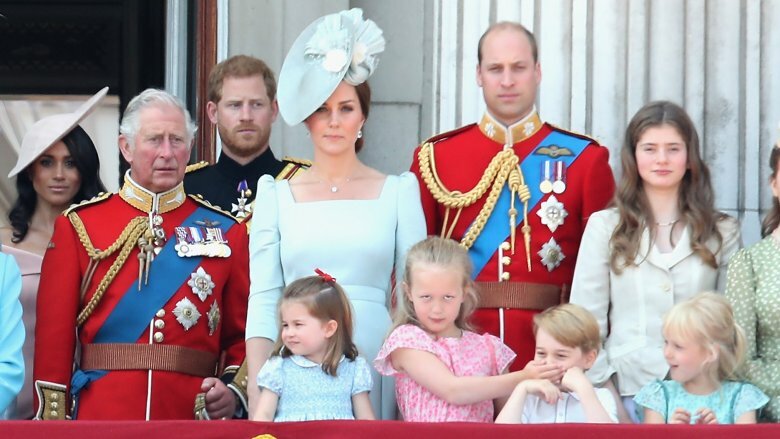 According to etiquette expert William Hanson, this is a tradition that royal kids have had to follow for generations, one that the senior royals are clearly keen to keep alive. 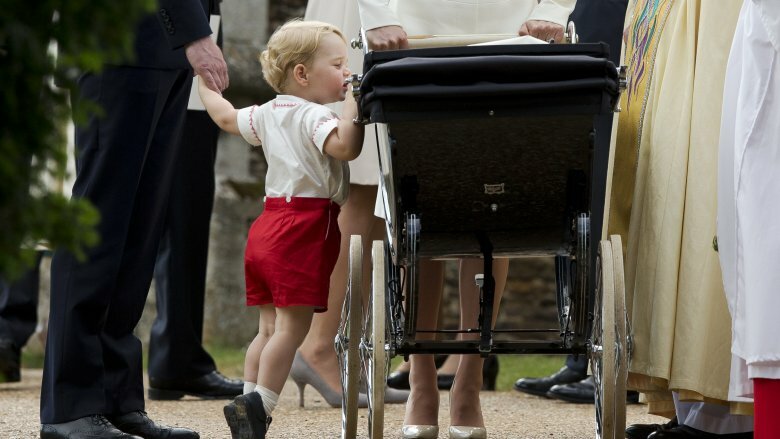 "It's a very English thing to dress a young boy in shorts," Hanson told Harper's Bazaar. "Trousers are for older boys and men, whereas shorts on young boys is one of those silent class markers that we have in England." The current generation of royals (Meghan Markle in particular) are most definitely helping the royal family to modernize, but the old guard apparently still draw the line on "suburban" looking pants. "Although times are (slowly) changing, a pair of trousers on a young boy is considered quite middle class, quite suburban," Hanson explained. "And no self-respecting aristo or royal would want to be considered suburban. Even the Duchess of Cambridge." Prince George broke that rule when he wore some super cute custom made military pants to his uncle Harry's wedding, with the queen clearly happy to make an exception in this instance. Her Majesty will have no say in how Pippa's son dresses, which will surely come as relief to him — no child wants to be dressed by their great grandmother-in-law after all! If there's one thing the queen hates more than trousers on a pre-teen boy, it's selfies. This filters down through the family, as many royal enthusiasts have discovered to their disappointment over the years. When 63-year-old Barbara Miller met Meghan Markle in 2017, she asked for a selfie with the former Suits star, but Markle refused. "She said, 'Thank you very much for braving the cold,'" Miller told OK! Magazine. "I said, 'Can we have a selfie?' and she said, 'We're not allowed to do selfies.'" It's not that Markle is rude, she was simply following orders from the top. Turning your back on a royal to take a selfie with them is considered disrespectful, and anyone who chances it and asks for a quick photo will be politely declined. It's a rule that won't impact Prince George's life for a few years yet, but try telling a teenager they aren't allowed to take selfies. It's a problem that the Matthews baby won't have to contend with. Pippa's son will be free to take selfies with whomever he likes, and the chances are he'll come across more than a few famous faces in his lifetime — his uncle on his father's side is the reality TV star Spencer Matthews, an alleged womanizer dubbed the "black sheep" of the family by the Daily Mail. Even if Prince George was allowed to take a selfie, he'd have nowhere to post it, because he isn't allowed on social media. Both Kate Middleton and Meghan Markle removed themselves from all social media platforms prior to joining the royal family, and as the future head of it, George will follow suit. Those rules could well have slackened by the time George takes to the throne, but even then he isn't likely to be sharing his #KingLife on Instagram. Pippa's son, on the other hand, will grow up with Instagram and Twitter and any other social media platform that might spring up over the new few decades. Because he won't be a working member of the royal family he will be allowed to share whatever he wants with the public, just like minor royals Princesses Eugenie and Beatrice of York. Eugenie has been a hit on Instagram since joining in March 2018 (she has over half a million followers and only follows 19 accounts at the time of writing), often posting throwback photos that royal lovers would no doubt find fascinating. Eugenie follows a few royal-related accounts but she isn't following the official Buckingham Palace one, and it's just as well. Whoever runs the Palace account dropped a major clanger when they referred to the princess by her sister's name while trying to sell mugs commemorating her wedding. 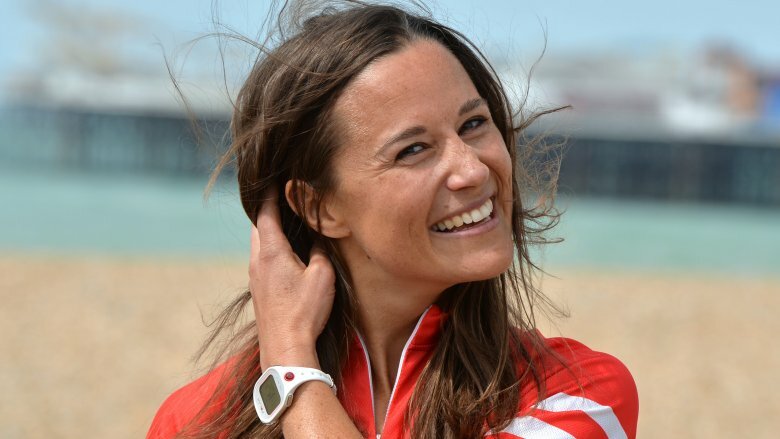 Pippa might want to double check her son's output before he posts it. You would think that Pippa and Kate Middleton's kids would at least be able to spend Christmas day together, but this isn't likely to ever be the case. 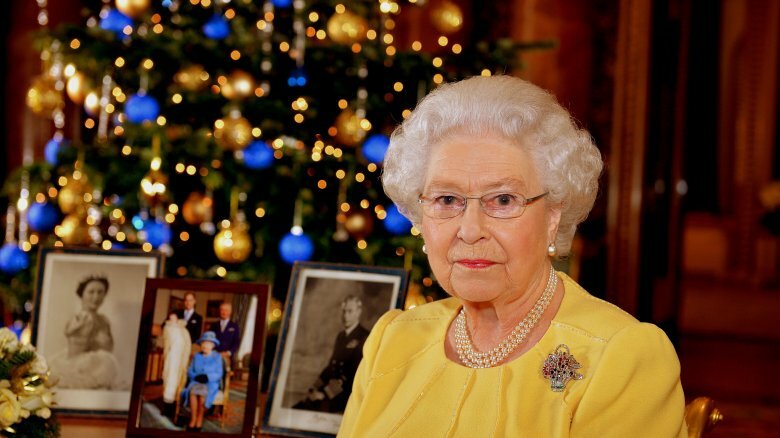 While they'll probably see each other in passing over the holidays in the years to come, it won't be at the queen's special festive gathering. Every year Her Majesty and the main, working royals get together to spend Christmas and New Year at Sandringham, a 24 hectare estate that has been privately owned by the royal family since it was purchased by Queen Victoria back in 1862. The queen made an exception for Meghan Markle, who in 2017 became the first royal fiancée to receive an invite to Christmas at Sandringham, but that was a rarity. According to Express, even Kate Middleton didn't make the Sandringham guest list until after she married William, so her sister's son doesn't really stand much of a chance of making the cut. Her Majesty also has a pre-Christmas lunch at Buckingham Palace every year so she can see all of the lesser royals before the A-team sets off for Sandringham, though Pippa and her husband don't even qualify for that event it would seem. Pippa did join the royals for a Christmas church service in Sandringham village last year, however, so if this becomes an annual tradition then her son and George will at least get an hour or two to discuss what Santa brought them. Before you go feeling too sorry for Pippa's son over Sandringham, let's get into what it actually means to be a royal kid at Christmas. The Matthews child will presumably eat his Christmas lunch with his parents, but for George and his sister Charlotte this isn't allowed. Speaking to Hello!, former royal chef Darren McGrady revealed that royal children have to eat separately from the adults until they've learned "the polite art of conversation" to a satisfactory level. "The children always ate in the nursery until they were old enough to conduct themselves properly at the dining table," McGrady told the mag. "For the Queen there was never a case of putting a high chair at the table with a little baby squealing and throwing food. It was Victorian. The children's place was in the nursery and Nanny would take care of them. It's your modern day Downton Abbey." Christmas is one thing, but what about the rest of the year? Once again, George's younger cousin holds the advantage in this department. As a royal, George must follow the family's food protocol, which means no foie gras, no garlic and especially no seafood. "It is a very sensible move to abandon having seafood when out and about on public duties," royal butler Grant Harrold told the Express exclusively. "We don't want a member of the royal family having a serious reaction to food poisoning, especially [...] on an overseas tour." We'll have to wait a few years to find out which school Pippa will send her son to, but one thing's for sure — his day to day school life won't be anywhere near as hectic as his cousin's. George's father Prince William was the first future monarch to be schooled outside of Buckingham Palace's high walls, and his son is doing the same. The young prince is a pupil at Thomas' London Day School in Battersea, south-west London, which has sadly become a target. According to the Daily Star, woman was arrested for stalking after she reportedly showed up at George's school "twice in 24 hours." Scary as that sounds, it was likely the least of the royal family's worries. With the seemingly ever-present threat of terrorism looming over European capital cities, as of this writing, it turns out police have already foiled a proposed attack on George's school. In May 2018, ISIS supporter Husnain Rashid belatedly pleaded guilty to several charges of encouraging terrorism, including "lone-wolf" style attacks on the school and other prominent locations — he even photoshopped two masked jihadist fighters over a picture of the school. As a result, personal bodyguards have taken up residence in a house across the street from the school. "[It] gives them a perfect vantage point to watch over George when he is playing," one royal security source told the Daily Star. The royal family's security tab (which is payed for by the Metropolitan Police) is thought to total at around $150 million every year.